Some of the most popular Sicilian products are ceramics. 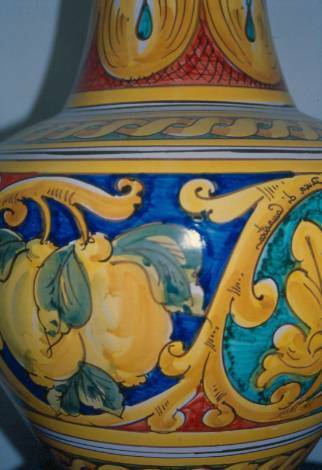 A special type is produced and decorated in Caltagirone, a large city 45 minutes from Catania. Combining water, earth, air and fire, according to Greek, Roman and Arabic traditions, the artisans of Caltagirone became particularly active in the1700's. Caltagirone today retains its wealth of experience and has established many traditions through the formation of a school and ceramics' museum, which has introduced the ceramics of Caltagirone to the world. The design of Caltagirone, which we find on plates, vases, decorative objects and furniture, is characterized by the presence of acanthus leaves, typical of the Greek tradition, and the prevalence of green and yellow colors.